A view of the Redemptorist Monastery in North Perth, Western Australia. This Federation Gothic Style Monastery and the adjoining church were designed by Michael and James Cavanagh in 1902 for the Redemptorist Order of the Catholic Church, which had been established in WA in 1899. 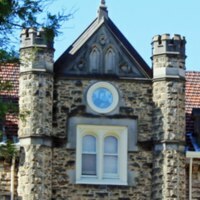 The building was opened by Bishop Gibney and Abbot Torres (from New Norcia) on 13 September 1903, and an additional monastery wing was added in 1912. The monastery and church were added to the WA Heritage Register in 2006. The monastery is a three-storey building constructed from Cottesloe limestone. The arches around the main doorway are decorated with an acanthus leaf design matching the door to the Church. The entrance is flanked by two hexagonal columns that extend beyond the rooftop to form crenellated turrets. The upper level is also distinctive for its decorative stone corbels and false machiolations, and the elaborate blind tracery adorning the gables and pinnacles. 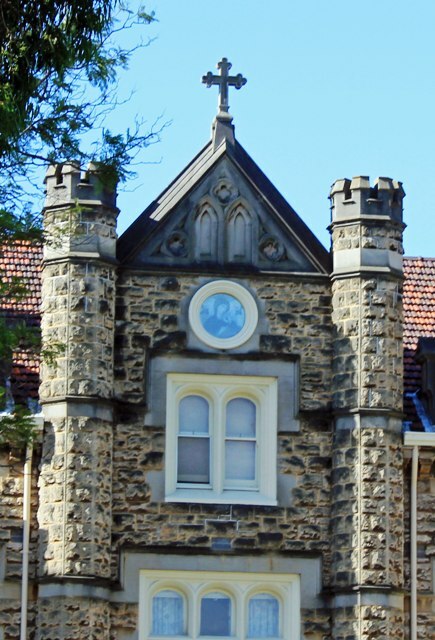 “Redemptorist Monastery, North Perth, Western Australia,” Medievalism in Australian Cultural Memory, accessed April 25, 2019, http://ausmed.arts.uwa.edu.au/items/show/597.